Faded black trim can be a real eyesore on any vehicle and it makes the vehicle look worn and dated. There are many products on the market that can be used to temporarily rejuvenate faded trim, but Solution Finish struck my interest as it appeared to darken severely faded trim much more than other products I have seen. 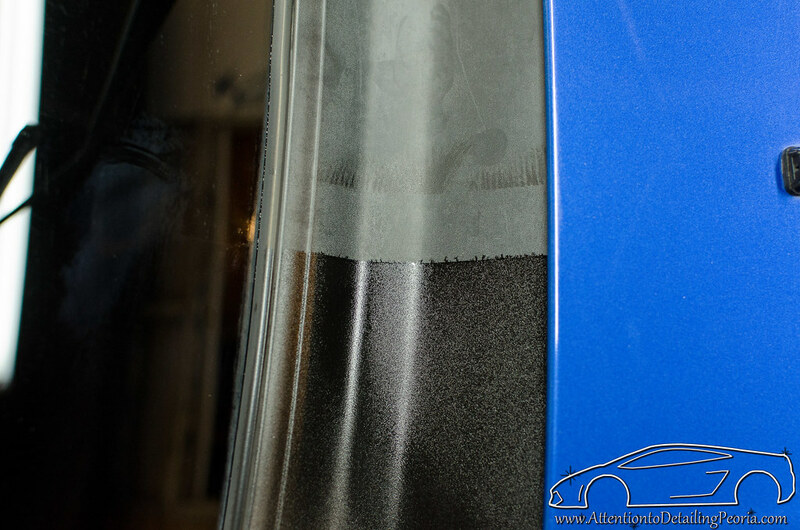 Solution Finish Black Trim Restorer restores black surfaces to a deep, rich finish, without any “wet look” or shine. This unique formula combines ancient ingredients with advanced polymer technology to provide a spectacular, long-lasting, black, protective finish. Use it to restore, condition, and protect bumpers, pads, trim, mirrors, mud flaps, window trim, seals, running boards, truck bed caps and covers, handles, wiper blades, etc. Another big plus with Solution Finish is that it is formulated for professional use, meaning it is a silicone-free solution that uses all natural oils and is VOC compliant. If you are looking for a great product to help restore faded trim, look no further then Solution Finish Black Trim Restorer! I chose to test this product out on the wiper cowl of a 2004 Subaru STi that I was working on. The faded plastic became much more noticeable once the vehicle was cleaned and polished. Prep work was very straight forward. The trim was cleaned with Meguiar’s D103 All Purpose Cleaner (which is now discontinued – D101 is a great alternative) during the initial wash of the vehicle, and was then wiped down with diluted IPA just before applying Solution Finish to ensure the surface was clean. Shake bottle well and apply a small amount to applicator pad or microfiber sponge. Use a clean microfiber sponge or foam pad to buff off excess and wipe off glass and paint (will stain unsealed paint). The following photo shows an excellent comparison of a restored area compared to the original faded trim. This was approximately 1 minute after application and after very gently wiping the surface to remove a couple of high spots where the product was applied too thick. Solution Finish left a dark, but very natural looking finish on the treated area. It has a slight sheen to it, but was completely dry to the touch. Application took just a minute or two, and the wiper cowl looked as good as new when I was done. I was very impressed at how little product was needed to provide such great coverage. The finish was very even (no streaking or dark spots) and it really made the car look much better. For testing purposes, I got a little bit of product on the surrounding paint and glass. I found that Solution Finish was easy to remove when wiped away immediately, but as the instructions state, it can stain if you are not careful. Gloves should also be worn as this product can stain clothes and skin. I am looking forward to seeing how this product holds up. It was extremely easy to use and provided fantastic results. A little product goes a very long way, so even the smaller 1oz bottle would be enough to cover quite a lot of trim. If you’re looking for a quick and easy way to protect your trim, consider giving Solution Finish a try. I was very pleased with the results that I got on this STi! Detailed Image carries this product in individual bottles (1oz & 12oz), or as a Solution Finish Kit that contains: 1oz Solution Finish Black Trim Restorer, 4oz Denatured Alcohol, 2 Latex Gloves, 2 Microfiber Applicator Pads, Microfiber Towel (16 x 16), and Applicator Brush. I am really interested in seeing a followup on how this holds up. I have trim on my BMW and cowling that looks like it sat in a dessert on my new car that seem to not take anything. It simply comes off in one wash or rain even using the expensive stuff. I just asked the owner of the vehicle for an update. He reported that the trim still looks good, but it is not quite as black as when the product was first applied. It has been 2 months since this product was applied, so it appears to be holding up well for him. Im looking to see how it holds up also. I recently bought Cquartz Dlux and have read it is one of the best. DLUX is my all time favorite trim product… I have had it on the wiper cowl of personal vehicle for over a year and the plastic is still dark and beads water very nicely. As I mentioned to Robert in the comment above, I just received an update from the owner of the vehicle used for this review. His trim still looks good after 2 months. Thanks for reading! It stated above that it can be used on running boards. Everything that I have tried has made them very slippery. so I’m wandering if this will do the same. Hey Bruce, I’ll be completely honest. I have no experience with this product on running boards. I would recommend trying it in an inconspicuous area to see if it produces the feel and finish you are after. i also own an 06 sti and my trim and cowl looks like this if not worse i have gtechnic c4 sitting on my shelf waiting to be applied i know it will take care of the issue but my wiper arms that are black metal are looking just as bad im not sure if i should attempt to apply it to my black wiper arms or to have them repainted im trying to stay away from repainting them as i would have to cover the entire car to prevent over spray getting all over ? 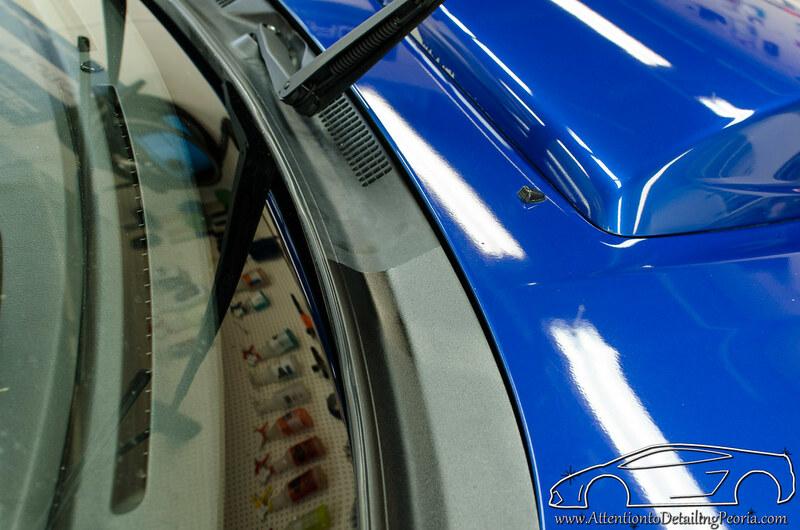 Given that the wiper arms are smooth, painted metal, I would not apply the trim restorer to them as it is not intended to work on metal. If you are going to attempt to paint them, I would do some research on how to remove them from the vehicle so you can properly prep for painting and to avoid potential issues with over spray. How about this trim restorer on a new vehicle to help hold the black color? A trim coating would be a great option for your brand new vehicle. A product like 22ple VR1 or GTechniq C4 would provide you with an even darker appearance and years of added protection. These products may be a bit more expensive, but they will surely keep your new trim looking like new for a very long time! Thanks for reading! Once I have applied the Solution Finish Trim Restorer, should I apply 303 Protectant to preserve it? This is for an everyday use minivan. Thank you for the help. This product looks like it could be very helpful for me. My truck has some vinyl that is fading and turning an odd blue color. I’m hoping this product will help get it back to black. Do you think this would work on interior? If not what might you recommend? I can send pictures of the vinyl. It’s the same material as a dashboard. Johnnie: I do not think 303 is needed to preserve the Solution Finish, but I certainly don’t think it would hurt if you wanted to use it. Try it out and let us know how it goes! Joe: I do not believe this product was intended for interior use, however it is great for faded exterior trim. Check with the manufacturer for more information. I was wondering if the product bleeds any on the paint? I was thinking about door molding but was afraid that it would run down the doors. Chuck, Solution Finish will be completely dry to the touch. If excess product was applied, it should be carefully wiped away and left to dry for a little while. I have not experienced or heard of any bleeding/running issues. I was very disappointed with my use of Solution Finish Black Trim Restorer. It didn’t work at all, though I carefully followed the procedures in the on-line video. I applied it twice to the faded black plastic trim between the side windows on my 1995 Honda Accord. It was not absorbed at all and didn’t make the trim any blacker. I paid $14.99 for a one-ounce bottle of Solution Finish, with the understanding that it was backed by a guaranteed full refund if it failed to work. The company’s return policy states I won’t receive a refund of the $5.99 shipping charge, nor my mailing cost to return it, but I do expect a $14.99 refund. Hey James, sorry you did not find the Solution Finish to meet your needs. I have used this product many times now and have been impressed each time. I have never used it on the pillar area, however, as this area is usually a different type of finish than traditional trim. Did you test the product on any other areas? Looking at some pictures of the 2005 Accord, the pillars appear to have a satin sort of finish on them when new. This is not the type of surface finish that is restored with a product such as solution finish. 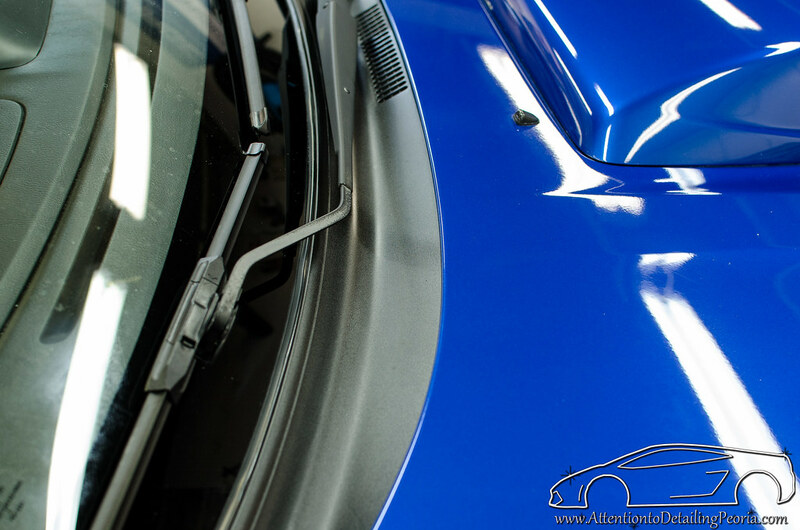 The material should be bare plastic trim such as what is commonly found around the bottom of the bumpers/side skirts and windshield cowl. Hello James, Sorry you had trouble with Solution Finish on your Honda…Honda owners are some of our best customers.Your trim most likely had a sealer on it that needs to be removed first. I looked up your name in my records and couldn’t see any place where you contacted us. But, I am more than happy to honor the guarantee and will gladly add in shipping. Any word on the protection coating form solution finish i heard mentioned in a pod cast for pro detailers that would last up to a year. I have used this product and am extremely happy with the results. I have used it on all forms of rubber, plastics, textured and smooth surfaces. To the point on metal, I have actually used it on wiper arms, black metal bumpers and even black diamond plated surfaces and it actually works well. Although it is intended for trim as mentioned, it did work on the metal surface. I have not asked the owners about the duration of the metal application or if it have any run issues. Since I’ve not heard any complaints about it, I choose to think it was ok. Solution finish has been my full time and only go to trim restorer. I have used others but this has been the best out of the others. I have not used CQuartz Dlux, so I don’t have a comparison. Whats up Zach,After applying solution finish,I was going to more protection by topping it off with gyeon trim,is that something that can be done? Hi Michael – I have not specifically used Gyeon Trim on top of solution finish, but we have used GTechniq C4 and CarPro DLUX on top of Solution Finish for added protection and they work quite well. I assume Gyeon Trim will work just fine, I just have no experience with that product. Make sure Solution Finish has completely dried prior to coating. I own a 2003 Chevy Avalanche, the cladding has a rough texture and is faded, what do you recommend to bring back the black color, thanks Mike…. Mike, solution finish should help! I’m sorry to hear that. We have had nothing but great success with Solution Finish when it comes to restoring faded plastic trim. It is nice to see that there are still companies out there that provide good customer service.